While landing page event goals are only available for use in new campaigns, they operate in a very similar fashion to landing page goals, which are found in legacy campaigns. In this article, you will learn about the 7 types of landing page event goals, how they can be used, and how to set them up. 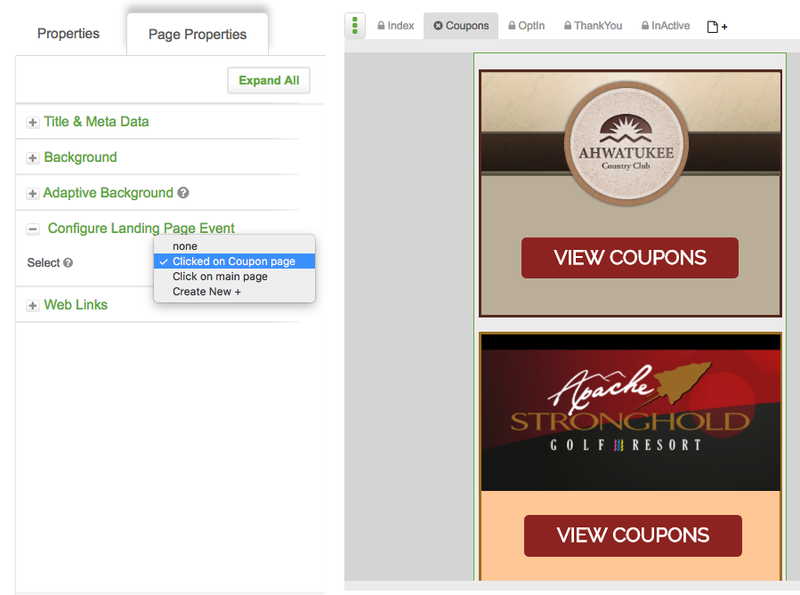 Landing page events can be set up from the builder or landing page editor. The landing page editor approach requires less setup work and works great if your landing page is already designed. If you are setting up your campaign logic first, setup from the campaign builder will be a better option. 2 - Select &apos;Landing Page Event&apos; in the drop-down list of goals. 3 - Choose your desired landing page event from the seven available options in the drop-down list of landing page goals. 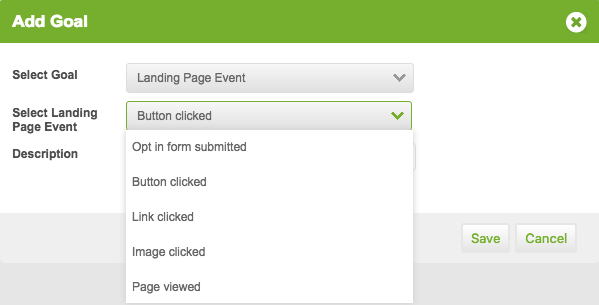 4 - This step is only required when you have selected opt-in form submitted as your landing page event. Select the opt-in form that when submitted by a contact, will achieve this goal. Unless you have multiple landing page sets in your campaign, there will only be one opt-in form available for selection. 4 - Give your goal a name. This is only for internal purposes and will never be seen by contacts. Click &apos;Save&apos;. 5 - Configure your landing page event goal if it is red. 1 - Navigate to your landing page editor. 2 - Click on the landing page component that you would like to track. 4 -Give your goal a description then click the &apos;Save&apos; button. This landing page event goal will be added to your campaign builder. If your landing page event is red, as shown in the image below, it is not configured properly and needs to be assigned to a component in your campaign. 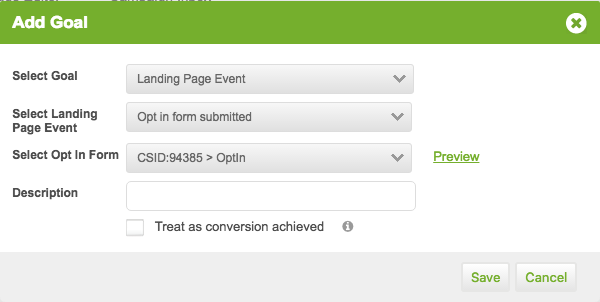 3 - Expand the Configure Landing Page Event section and select your Landing Page Goal from the drop down options. 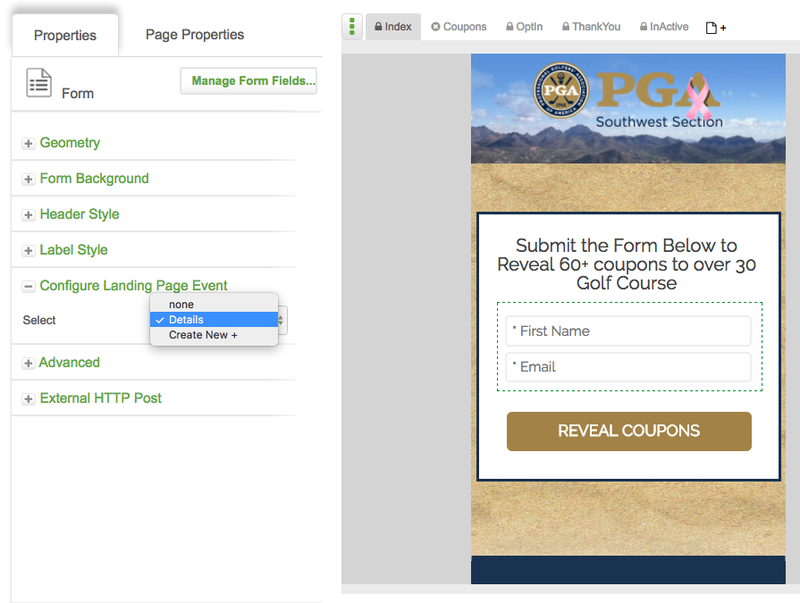 The images below show you how to configure a form submitted and page viewed goal.